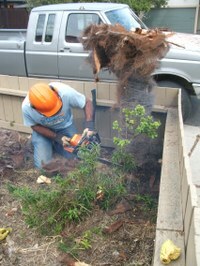 Home Improvements: Now, What Else Can We Do With a Chainsaw? It's been a little while since I've posted any pictures of the construction progress here at Harbor Dr. Yesterday was kind of a big day in terms of outside improvements, so I took some pictures. 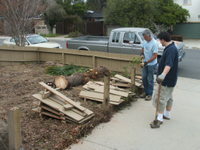 We are getting ready to start beautifying the front yard. 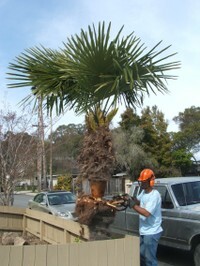 First step: Remove the ill-placed Windmill Palm Tree. 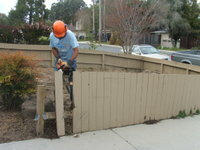 Step 2: Remove the ugly fence in preparation for the installation of a new fence. 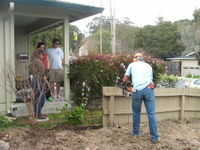 George brought his chainsaw over to help with Step 1, and ended up using it for Step 2, too -- which was pretty fun to watch! 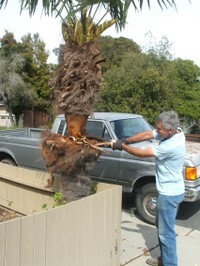 Removing the palm tree: This turned out to be a tad trickier than we expected because it was so hairy. 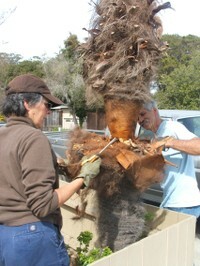 We had to dig down through the hair to the actual wood before the chainsaw could be used. 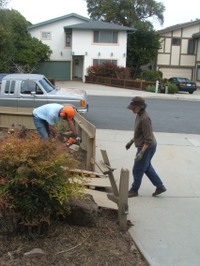 Removing the fence: We thought we were either going to hire someone to pull the fence out, or that Joe and Pam would attack the boards with a sledgehammer. Turns out, George had a much faster idea! 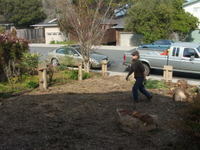 We'll still have to pull out the vertical posts, but we are thrilled with the fence progress. And I, personally, think the yard looks a million times better without the ugly fence! 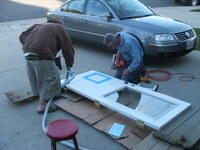 We also put George to work on a project for Kalli: Installing a cat door! 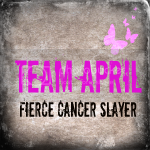 We're going to introduce her to it this morning. Aside from two little jaunts out onto Phil & Pam's upper balcony, this morning's venture outside will be Kalli's first in 11 1/2 months! She's so ready to go out -- and we are so ready to have her going out again! Thanks for all your help, George! !